Figure. Western Blot; Sample: Recombinant CYFRA21-1, Human. Figure. Western Blot; Sample: Lane1: Human Serum; Lane2: Human MCF-7 Cells; Lane3: Human A431 Cells; Lane4: Human HepG2 Cells. 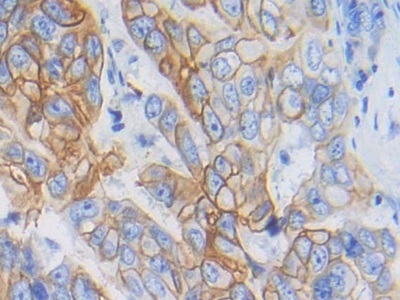 RPB246Hu01 Recombinant Cytokeratin Fragment Antigen 21-1 (CYFRA21-1) Positive Control; Immunogen; SDS-PAGE; WB. 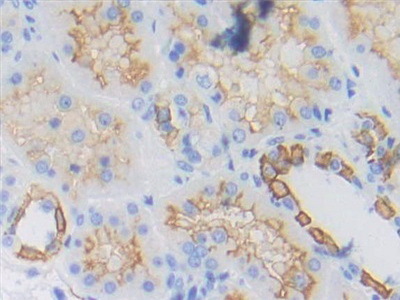 CPB246Hu21 OVA Conjugated Cytokeratin Fragment Antigen 21-1 (CYFRA21-1) Immunogen; SDS-PAGE; WB. 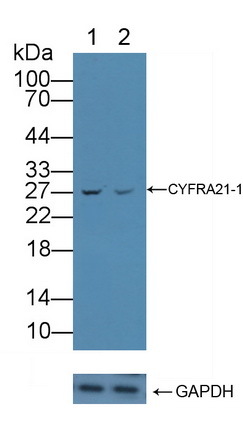 CPB246Hu11 BSA Conjugated Cytokeratin Fragment Antigen 21-1 (CYFRA21-1) Immunogen; SDS-PAGE; WB. 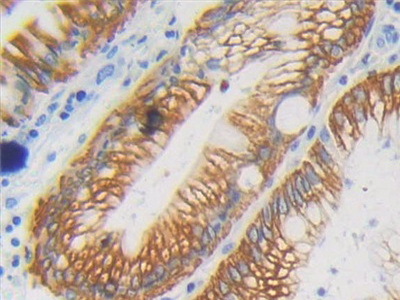 PAB246Hu01 Polyclonal Antibody to Cytokeratin Fragment Antigen 21-1 (CYFRA21-1) WB; IHC; ICC; IP. 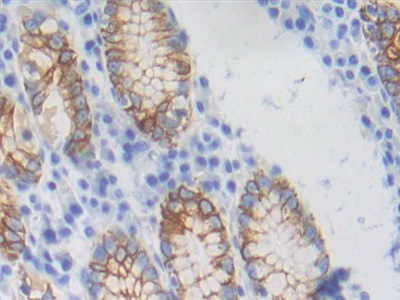 PAB246Hu08 Polyclonal Antibody to Cytokeratin Fragment Antigen 21-1 (CYFRA21-1) WB; IHC; ICC; IP. SEB246Hu ELISA Kit for Cytokeratin Fragment Antigen 21-1 (CYFRA21-1) Enzyme-linked immunosorbent assay for Antigen Detection. 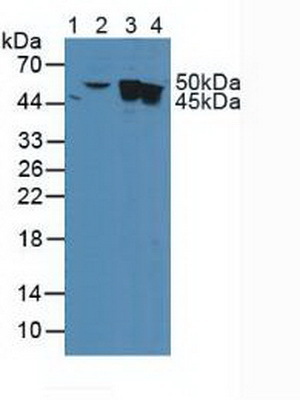 SCB246Hu CLIA Kit for Cytokeratin Fragment Antigen 21-1 (CYFRA21-1) Chemiluminescent immunoassay for Antigen Detection. KSB246Hu01 ELISA Kit DIY Materials for Cytokeratin Fragment Antigen 21-1 (CYFRA21-1) Main materials for “Do It (ELISA Kit) Yourself".